Installation of this feature pack is very straight forward, just download the installer and run the wizard. 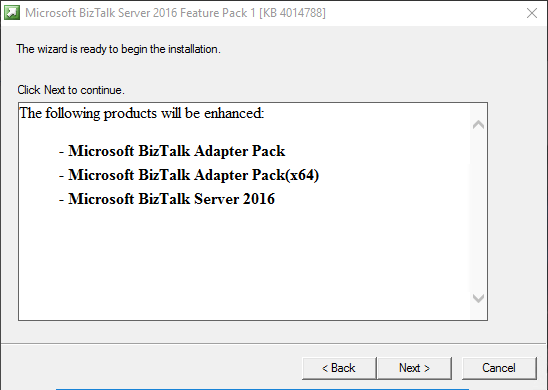 Once installed, you will see the new features in your BizTalk installation. One of the places where BizTalk was falling behind in this world where agile is becoming increasingly important was the ALM story. Of course, we had projects like the BizTalk Deployment Framework (of which I am a big fan) which helped with this, but being dependent on a third party for this proved to be cumbersome at times. Thankfully FP1 addresses this, and gives us the option to do continuous integration using VSTS! This allows us to automatically deploy new applications or update existing applications after checking in our project. After you have installed the feature pack, you can create a new BizTalk project, called BizTalk Server Application Project. If you don’t see it in the list, make sure to select the latest .NET framework version. 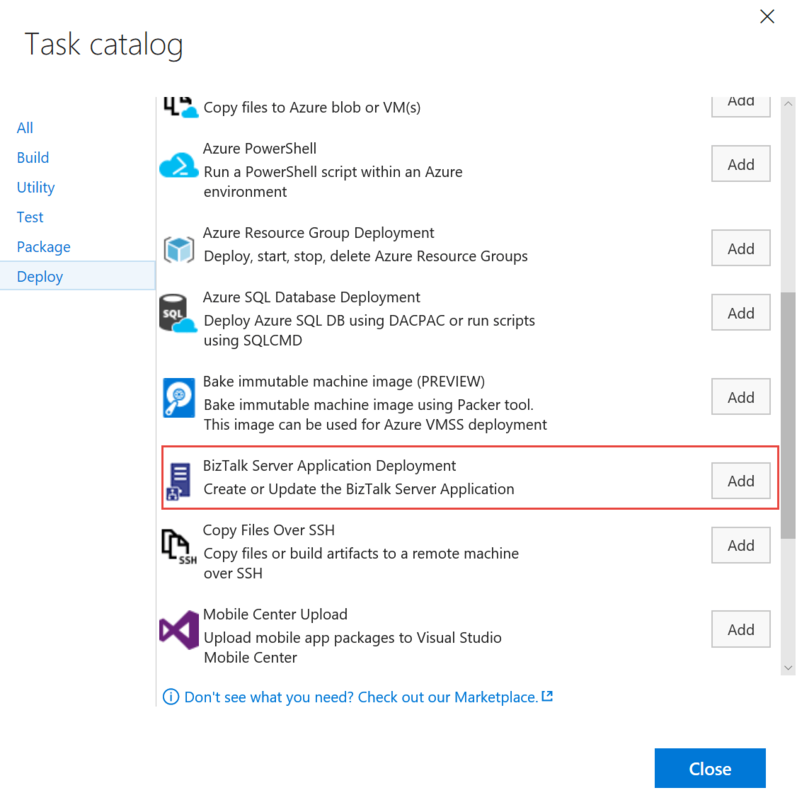 To be able to deploy the project, we will also need to add the Deploy BizTalk Application task to our VSTS. 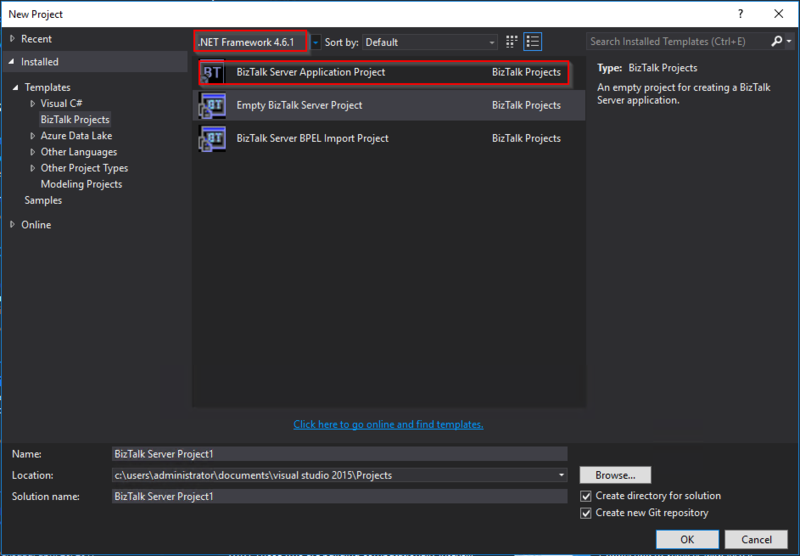 This will give us a new task we can use in our VSTS build definitions. You can check here for a full overview on how to set this up. With FP1, we now have the option to log our message data to Application Insights. 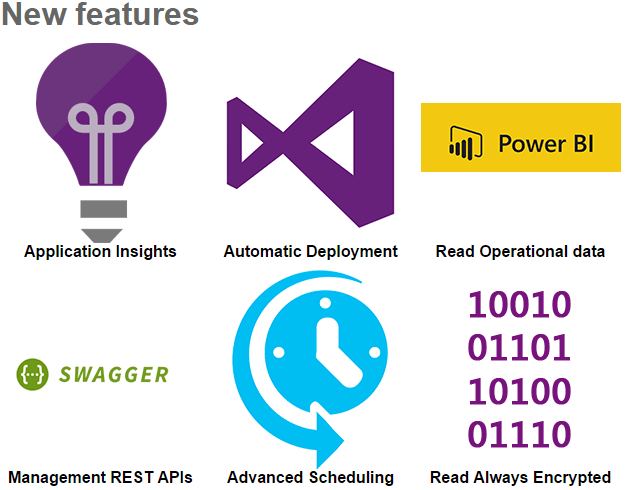 Application Insights is already supported or planned to be supported in various places within Azure like Web and API apps, Azure Functions and Logic Apps, and as of now we can use this platform from BizTalk as well, allowing us to have a consolidated tracking mechanism for our messages both from on-premise and in the cloud. This is the same data we see in our tracking data, and can be set up very easily. 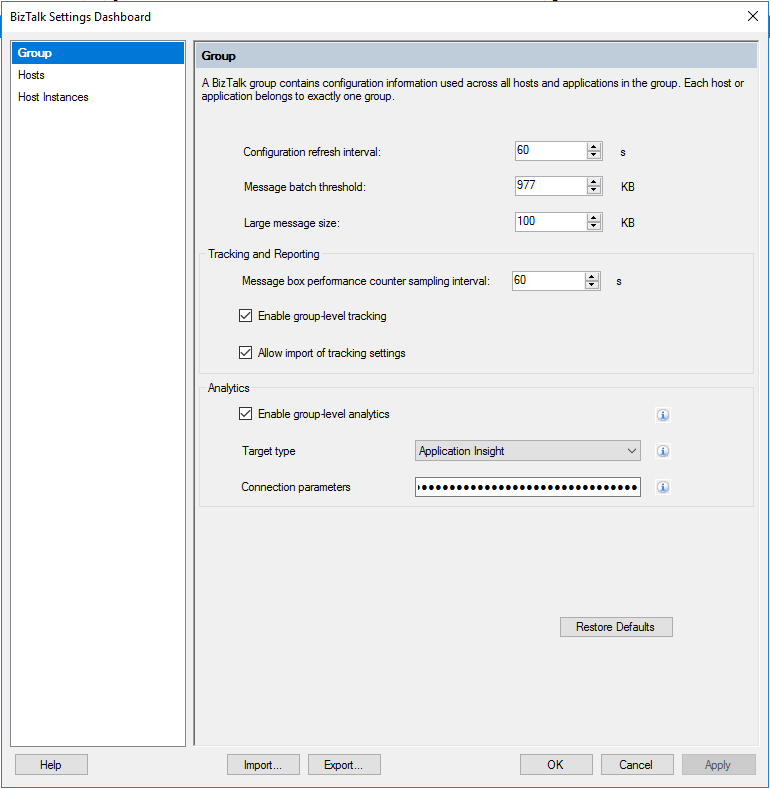 To enable integration with Application Insights, open the settings of your BizTalk group, and check the Enable group-level analytics option. 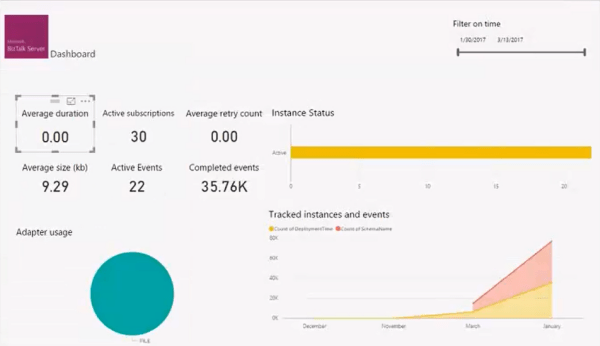 In the connection parameters, you have to enter the instrumentation key, which can be found in the portal for your Application Insights instance. And finally enable analytics on your port. You can check here for a full overview. 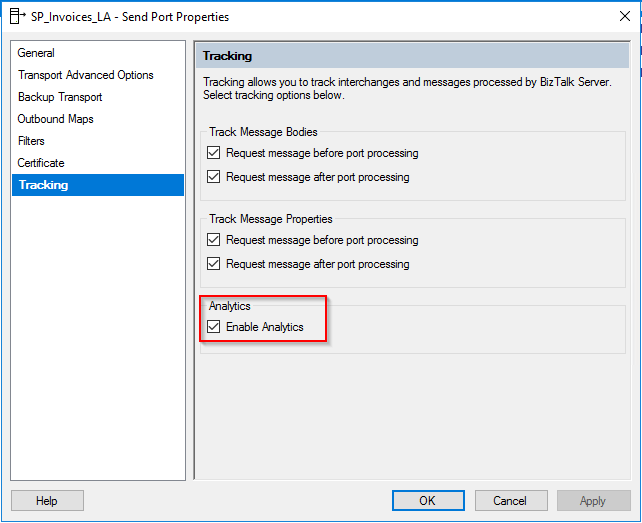 With this feature pack, BizTalk 2016 now also exposes REST API’s with which you can manage your BizTalk artifacts, like your ports, orchestrations, hosts, pipelines, as well as operational data like retrieving and working with messages, service instances and much more. This gives us the possibility to integrate our BizTalk management in any application we want, as well as easily script our BizTalk management tasks. And of course, the API’s are all documented with Swagger, allowing us to get started with this right away. You can read here on how to enable the REST API’s. And what is more, we can also use PowerBI to visualize the feed from these API’s. The BizTalk team provides an out of the box template for this, which you will find in X:\Program Files (x86)\Microsoft BizTalk Server 2016\OperationalDataService\BizTalkOperationalData.pbit which can then be loaded into PowerBI Desktop. This template will give you a starting point, on which you can then expand and build your own PowerBI dashboards, which you can also integrate in your monitoring solution like BizTalk360. 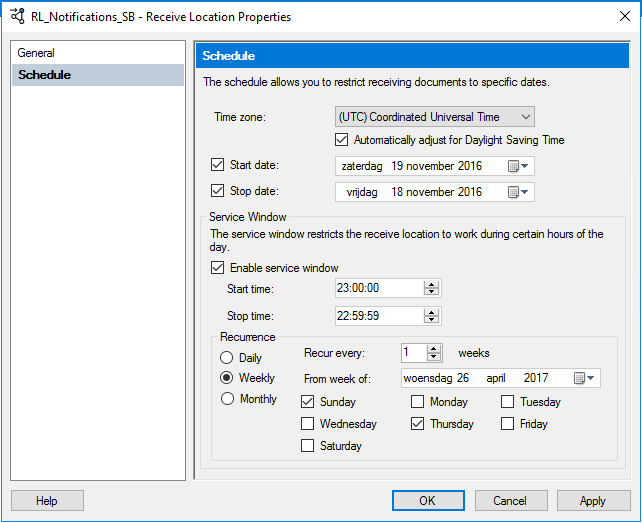 When we wanted to schedule something on BizTalk’s receive locations, we were always very confined, with just being able to specify a start date, a stop date, and the start and stop time for the service window. With Feature Pack 1, this has now been made much more granular, allowing us to set much more granular schedules, allowing us to trigger every x days, or even on certain days of the week or month. Many of these features could already be found in the Scheduled Task Adapter by Sandro, which still provides some more advanced options, but it is good to see Microsoft looking at the popular extensions the community created and incorporating them into the product. 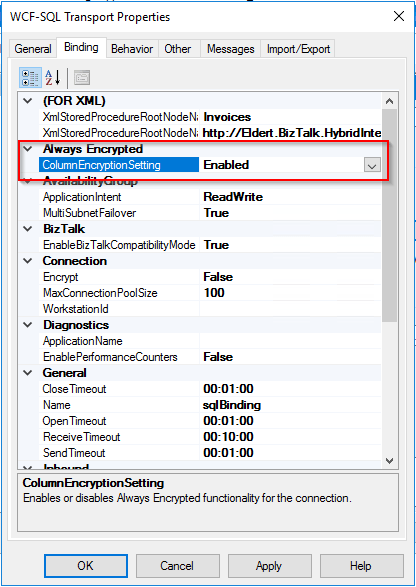 And finally, BizTalk can now use encrypted columns in SQL server, which allows us to protect sensitive data in SQL server.